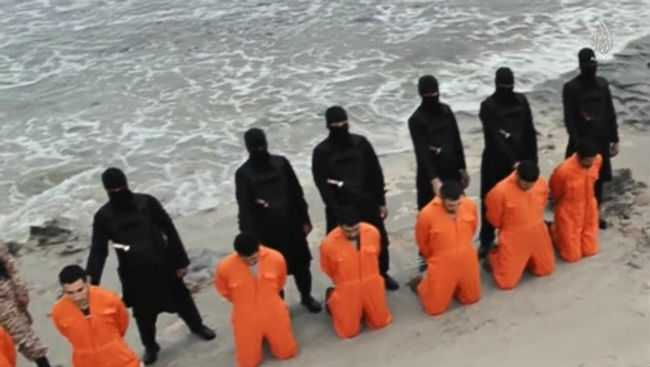 VATICAN CITY (CNS) — The 21 Coptic Christians who were beheaded by Islamic State militants died as martyrs, invoking the name of Jesus, said an Egyptian Catholic bishop. In line with Pope Francis’ assertion at morning Mass Feb. 17, Bishop Antonios Aziz Mina of Giza told the Fides news agency that the “diabolical” video of the Christians’ massacre, intended to “spread terror,” was a testament to their martyrdom in the faith. The video of their beheading, released Feb. 15, shows that “in the moment of their barbaric execution,” some of the Christians were repeating the words “Lord, Jesus Christ,” he said. Members of the Catholic community resolved to stay put, despite the killings and the emphatic calls from various authorities to evacuate the country. Following the news of their assassination in Libya, Christians in the various dioceses of Egypt began praying and fasting, as the government called for seven days of national mourning. Several Egyptian bishops have spoken about constructing churches, dedicated to the 21 martyrs, in their dioceses. Egyptian Prime Minister Ibrahim Mahlab announced President Abdel Fattah al-Sisi would arrange state funds for the construction of a church dedicated to the 21 martyrs in the Egyptian city of Minya, from which many of the victims hailed. In addition, by presidential decree, the victims’ families will receive financial compensation for the death of their loved ones (about $13,000), as well as a monthly stipend. The families are asking that the remains of their loved ones be returned to Egypt for burial. Al-Sisi, who also has referred to the 21 Christians as “martyrs,” paid a personal visit to Coptic Orthodox Pope Tawadros II Feb. 16 to extend his condolences. Pope Francis extended his condolences to Pope Tawadros in a phone call the same day. Back in Libya, members of the Catholic community resolved to stay put, despite the killings and the emphatic calls from various authorities to evacuate the country. “Few of us remain,” said Latin-rite Bishop Giovanni Martinelli of Tripoli, Libya. He told Fides, the news agency of the Congregation for the Evangelization of Peoples, Feb. 17 that many of those who remain are female Philippine nurses, who have decided to stay because of the dire medical needs in the city after the evacuation of the medical staff at the private St. James Hospital. This was very sad to watch, but one thing I know, GOD WILL HAVE HIS VINGENCE!!! The soul’s of the martyred will rejoice in heaven with Jesus Christ as they will watch their killers be tormented in hell!!! God Bless… all Christians in this World..
#For this world is not belong to us believers of truth..but the heaven prepared by our God Savior for us. I like the president of Egypt.